Local SEO is becoming more and more important as the days go by. Once, people didn’t realize the importance of local SEO and neglected it until they started seeing competitors who were using it, leap ahead in the search engine results. The time to act regarding local SEO is now. Procrastination is not part of the equation here at all. The old adage that “He who hesitates is lost.” sure is applicable here. The reason being is that Google counts on indexing your web pages that should have relative and pertinent information that makes surfers feel like there’s value to your site. People can’t make it to your offline business if you don’t emphasize where you are. It’s that plain and simple. You’ve go tot incorporate your location in every aspect of your site as well as your street address and zip code and contact info. The competition for those local business listings in Google is tough. The more info you put on your site that is relevant and pertinent and as service to the surfers, the better your rankings will be. You’ll need to get more authority inbound links too. Link building might be considered ‘old skool’, but it’s got lots of value if done correctly. Seek out those inbound links from the big sites. The sites with monster traffic and great reputation. You’re representing your locale and the better you make it look, the more attractive and authoritarian you’ll appear. Getting good citations is another step for great local SEO. What others say about you counts a lot. You need to get those customers to comment favorably about you all over social media as well as link to you from their sites. One might not think a customer with a small website means much, but indeed it does. When you have dozens of people linking to you, mentioning your good service and products and mentioning your location, that’s like having local SEO being done free. Another good tactic is to ask customers to take pics of them using your products. Video is better and have them upload to their YouTube sites, Facebook, and the other social media sites. If you have a clothing store, ask them to take pics and vids of them sporting your line of clothing. If you have a food service company, ask your customers to do the same. All these little mentions coming from real people is just what Google’s new software is looking for. Just remember to remind these customers to put your location and contact info in their tags and copy for extra punch. Once again, every little bit helps. Review sites are another factor that you must exploit. Get those customers to give good reviews on all those kinds of sites. If your customers have blogs, all the better. If they have mailing lists that might comprise of hundreds or thousands of subscribers, a shout out to your business will be noticed by Google as that information is shared. Don’t be a stranger to social media yourself. Take the risk to send out free samples or invite people to your offline store when they visit your area. Let’s say you have a barber shop, well you would say on a Facebook group something like, “Hey folks, if you’re ever in town, visit my shop at such-n-such street, mention this Facebook site and get 50% off.”. This will whet their whistles and they’ll go to your site to see how good you are as a barber. They’ll spread the word and you’ll have those conversions and rankings. So hop to it. 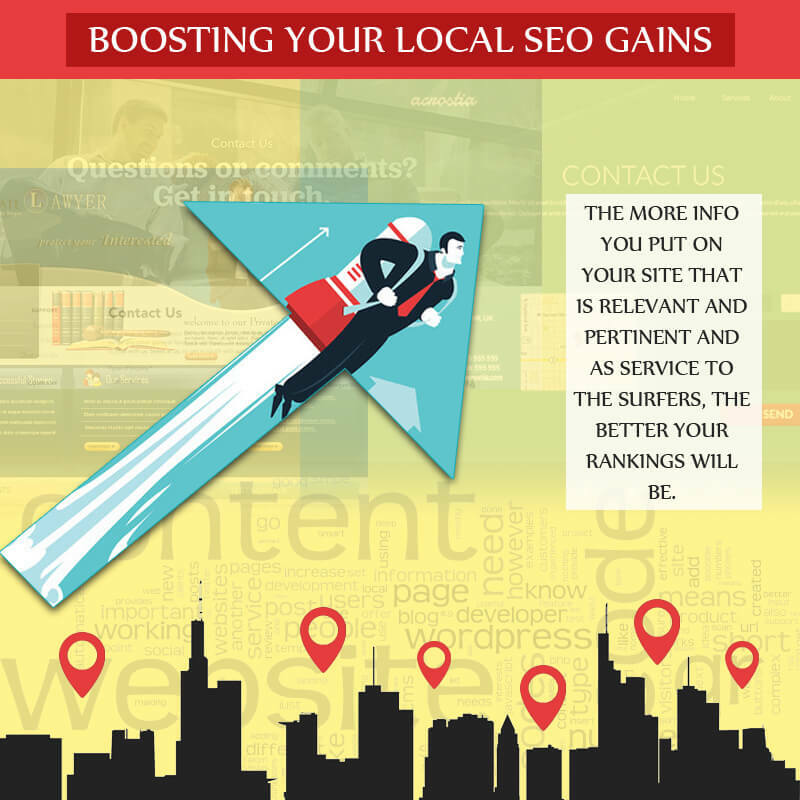 Get that local SEO game plan going on!